Here are quick scouting tips and threshold for each of these three insects. How to scout: Use a scouting square to mark out a 50cm by 50cm area. Beat plants growing within that area to dislodge the larvae. Count the larvae that have fallen to the ground and multiply by four to get the number per metre square. Larvae will hide under leaf litter and in cracks, so check closely. Sample at least five locations a minimum of 50 metres apart. Do not sample headlands and areas within the crop that are not representative of the field. Use the average number of larvae at the sites surveyed to determine if the economic threshold has been exceeded. Read more. Threshold: The economic threshold for bertha armyworm will vary with the cost of the insecticide and crop value. For example, if canola is worth $12 per bushel and total cost for the spray application is $12 per acre, the threshold is 17 bertha armyworms per square metre on average throughout the field. However, in a drought situation where leaf area is lower, berthas may be concentrated on pods. In that situation, a lower threshold may be more appropriate. See the full table in this Canola Encyclopedia section. Find links to the latest provincial bertha armyworm trap counts here. How to scout: With a standard sweep net (38cm diameter), take ten 180° sweeps through the pod area. Count the number of adult and late-instar (green with black dots) lygus in the net. Sweep in fair weather conditions (e.g., sunny, low wind, above 15°C) and between 10:00 and 16:00 to ensure lygus are active within the canopy. Proper sweet net technique. 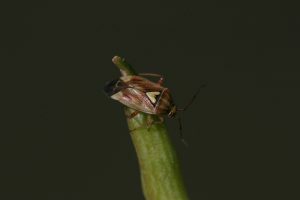 Threshold: The economic threshold for lygus bugs will vary with total application cost, crop value, crop stage and the moisture situation. 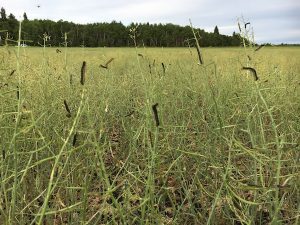 In very dry conditions, if canola is worth $12 per bushel and total cost for the spray application is $12 per acre, the threshold is eight lygus per 10 sweeps at the late flowering stage and 11 per 10 sweeps at the pod ripening stage. Threshold tables for lygus bug. In moist and high-yield conditions, the economic threshold is quite a bit higher. At early pod stage, 50 lygus per 10 sweeps (5 per sweep) could cause a 2 bu./ac. reduction in yield — which could be a more suitable economic threshold in this situation. At late pod stage (the last week or so before cutting), pods are too tough to penetrate. Read more. Diamondback moth larvae feeding on pods. How to scout: Pull out all plants within a 50cm by 50cm area (quarter square metre) or one square foot and bang them on the hood of your nearby truck, a drop-cloth or large piece of cardboard. Count the larvae. Multiply amount in a quarter square metre by four to get total per square metre. Sample a few areas of the field. Scouting techniques from the Canola Encyclopedia. Entomologists note the challenge in counting so many plants. If removing plants in a foot square area is difficult, individual plants can be removed and larvae shaken out. But if sampling individual plants, chose plants randomly and not by first looking for a larva or damaged plant. Multiply results from one plant by the number of plants per square metre. Again, sample a few areas of the field. Threshold: The number is quite high: 200-300 larvae per square metre (20-30 per square foot) in plants with flowers and pods. Read more.